When you trust a company to do a new roof installation on your home, they are sealing off your house against the elements, and making one of the largest accessories on your house come to life. You should trust it to a team that will do a great job and get it done the way you want it — call us! We’ve been at the top of our industry for years, and take pride in being the most customer-focused roofing company around. We go out of our way to go the extra mile where our competitors wouldn’t care to. Give us a call and find out for yourself! When you’re making a major improvement to your home or business by putting a new roof on it, you expect the best, right? You want a team of roofing contractors that will do it right, who have experience and know what they are doing. You want a team who is professional and highly trained, with all the right technology and techniques to install your new roof quickly, with no fuss, no hassle, and affordable rates. Well, you’ve come to the right place; we are just that team. If you are looking for high-quality roofing services, we can assist you there. Your full satisfaction is the hallmark of any completed job in our eyes. We will be in touch with you the whole way through the process, from when our roofers come out to meet with you for the free estimate and help you decide on which styles and colors will work best for your home, to the installation, and your ultimate satisfaction with the roofing system. We do what it takes to get it done right. When it comes to new roof installation for homes it doesn’t get much more beautiful than asphalt shingle roofs. We offer one of the top lines from the largest shingle manufacturer in the United States. We have over a dozen colors for you to choose from, so no matter what style home you are designing and building, we can help you choose the look that will best compliment your house. We also offer energy-efficient shingle roofing that we can use in installation or replacement that will help lower your energy bills by deflecting a majority of the sun’s rays, making your HVAC system work less. There is also the classic beauty of having a tile roof installed on your home, and while not every structure is set up to handle the additional weight, our team will be able to determine if yours is compatible. Whether you prefer the Spanish-Mediterranean style of clay tiles, or a more modern tile approach, our team will be able to give you a beautiful new tile roof! If you’re looking for a lifetime of ease, ask us about getting a new metal roof on your home! These wonder-roofs can last 50 years or more with minimal maintenance. No matter your style preferences, we can help pick out and install the perfect roof for you! When you need new roof installation for commercial properties, we have a wide selection of materials and styles that can suit your needs. 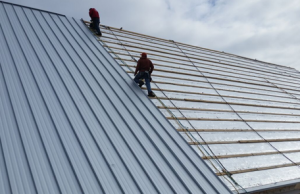 Regardless of whether your new building has a flat/low-slope roof, or a steep-sloped one; if you are looking for a rubber roof, TPO, Durolast or foam roof, we do it all. One of our roofers would be able to meet with you and go over the benefits of each type, and in coordination with your building’s specifications, work out which will be the best choice for your building. We perform new roof installation in Bentonville, Springdale, Fayetteville, and the surrounding areas. “Having been in the real estate business for 27 years, it has always been a challenge to find good and reasonably priced contractors to refer to my clients. I have had the good fortune to find Tyler Thompson of T.F. Thompson Co., who specializes in water intrusion and related issues. I have referred this company to several of my clients with extremely positive results! They have all been pleased with the work and work ethic involved. I also had the opportunity to hire this company to investigate and complete work on my own personal home. Tyler and his sub-contractor were extremely knowledgeable diagnosing and fixing the problem in a timely professional manner. The entire crew of workers were polite and conscientious of scheduling and finishing as quickly as possible. It was a great experience!